Do you know pies like the back of your hand? All pie makers and bakers, bloggers and butchers really need to have these pie facts up their sleeves to impress their visitors! Here at Pierate we thought we'd help out and put together the ultimate guide to everything you could ever need to know about pies. You'll become an instant expert on the history of pies, pies in popular culture and language, and also know more than a thing or two about traditional British pies. A pie crust holds some of the greatest things in life together. You can’t deny the attraction of a pie. Some compare it to a wrapped present – you can guess what’s in it from the outside, but you only know the true nature of the gifts inside once you’ve broken through the outer layer. The golden pie sits there, hot from the oven, with a glistening charm that melts the air around it. A dreamy puff of steam rises up through the centre and the smell of it pervades the deepest reaches of your senses. A bubbling ooze of gravy percolates through the crimped pastry edges. These are our clues to the secrets that lie within. Did you know? Mark Twain (aka Samuel Clemens, 1835-1910) loved to eat pies, especially Apple Pie and Pumpkin Pie. He regularly ate Huckleberry Pie to help him through periods of depression. The history of the pie is certainly intriguing. Not surprisingly, many countries lay claim to the first invention of a pie. However, some suggestions trace the history of the pie right back to 9500 B.C., where the ancient Egyptians during the Neolithic Period made pies out of oats, wheat, rye and barley, with a filling of honey. These early pies were then baked over hot coals. Drawings of ancient pies can be seen on the walls of the tomb of Rameses II, dated to be around 1250B.C. These ancient pies were also made by the ancient Greeks, who are said to be the inventors of pie pastry. Meat was encased in a flour-water paste, which was then cooked. Following the Roman conquest of Greece, pies were incorporated in the meals of wealthy and educated Roman families. The first recipe for pie pastry appeared in a cookbook in 1545. The book was entitled "A Proper newe Booke of Cokerye, declarynge what maner of meates be beste in season, for al times in the yere, and how they ought to be dressed, and serued at the table, bothe for fleshe dayes, and fyshe dayes" (available here). It is thought that prior to the mid 16th century, pie pastry was such a staple of the English diet that the recipe for making it was taken for granted by many cookbooks of the day. Pies recipes were taken from England to America following the European colonisation in America. It is said that George Washington, the first President of the United States, was a great fan of sweetbread pie. There are many phrases and sayings that include the word “pie”, such as ‘pie in the sky’ and ‘easy as pie’. The origins of these phrases are very interesting. Indeed, the origin of the word ‘pie’ is interesting in itself as it may have been derived from the word ‘magpie’, by notion of the bird’s tendency to collect desirable objects and put them in one place. You'll get pie in the sky when you die [That’s a lie!]." The song was intended to be critical of the Salvation Army, who Hill blamed for lulling workers into becoming complacent by promising salvation in Heaven while continuing to suffer on Earth eating hay. The phrase ‘easy as pie’ is derived from the works of Mark Twain (aka Samuel Clemens). Twain often referred to pie in his work in a positive light, describing people as ‘polite as pie’ or ‘nice as pie’. In The Adventures of Huckleberry Finn (1884), Twain wrote “You’re always as polite as pie to them”. The usage of pie here is in reference to how easy is to eat, rather than to make. Perhaps the most interesting etymology is in the phrase “to eat humble pie,” when one acts apologetically following an error. The phrase actually derives from “numble pie” (14th century) or “umble pie” (15th century), which was a pie that contained animal intestines and was eaten by the poorer classes. Samuel Pepys wrote about umble pie in his diary, writing on 8th July 1663: “Mrs Turner came in and did bring us an umble-pie hot out of her oven, extraordinarily good.” The word ‘humble’ is of Latin origin and its etymology is distinct to ‘umble’ – it just so happens that the words sound similar and are similar in meaning. The phrase “Who ate all the pies?” may have first been sung in 1894 by Sheffield United supporters at a football match. The chant was directed at William ‘Fatty’ Foulke, the club’s goalkeeper, who weighed 140kg. On the face of it, the poem seems quite nonsensical, but the poem actually symbolizes a major Taoist principle. By answering each riddle with Cottleston pie, the pie is symbolic of the idea that “things are as they are” – the Taoist principle of “Inner Nature”. The simple message is that some things are the way they are because that is simply the way they are and we don’t need to know the reason why. Once we recognize Inner Nature, we can recognize that we have certain limitations and we should not cross boundaries that we are not designed to cross. I ordered mincemeat and cheese." The poem is filled with a warm humour and eccentricity which is entertaining to both children and adults alike. Sky in My Pie, like Milne’s Cottleston Pie, is an example of a pie being used in nonsense poetry. It cannot be denied that there is a humorous connotation attached to pie, something which is further echoed in Edward Lear’s nonsense poem Calico Pie. They never came back to me"
Calico is a type of unbleached woven cotton, suggesting that a ‘calico pie’ was a pie made of fabric. The nonsensical nature of the poem is amusing, and the pie certainly seems to bear no reference to the rest of the work. Calico Pie, however, adds to the body of poetry which employs the unassuming pie to promote absurdity and wit. The Pierateers have themselves written the occasional ode to a pie, including Memoirs of a Pie Addict, written by SJL. Memoirs was a sadly-true description of what it is like to be truly obsessed by pie. Pierateers in the past have also written about the tribulations of life on the professional pie-eating circuit. Difficulties include the obvious health implications of eating an absurd amount of saturated fat, the stress of choosing from an ever-expanding array of options, and the unappeasable feeling of never quite being full of pie. A pieku is a haiku about pies - written in the traditional 5-7-5 syllable format with a pie theme. ARL wrote a pie review in pieku in January 2013, and piekus have also appeared in various forms around the Internet. The Rockbridge Pie Festival holds a pieku competition. Food and Wine has also held a pieku competition. Twitter is also a good source of piekus, with #pieku actually trending at one point last year. We've been keeping a list of celebrities who love pies. The list includes Warwick Davis, Miranda Hart and Barack Obama - alongside lots of other familiar faces. Did you know? US President Barack Obama once used the word "pie" 15 times in 88 seconds in a campaign speech. 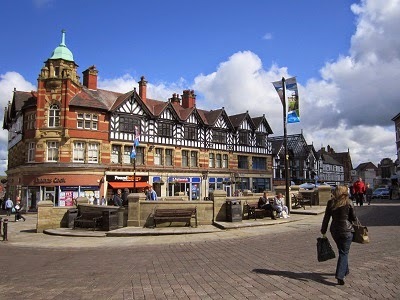 The British ca-pie-tal city of pie is largely recognised to be Wigan, home of several pie manufacturers including Poole's Pies and Wigan Pies, alongside the World Pie Eating Championships held each year since 1992 in Harry's Bar. But this town has gained pie fame not because of the volume of pies Wiganers eat (apparently Wigan consumes the same amount of pies as the rest of the country), but because of the 1926 general strike in support of coal miners. All around the country, workers downed their tools for nine days, bringing the country to its knees. In Wigan, however, workers were starved back to work sooner than the rest of the country - in essence forced to eat 'humble pie'. 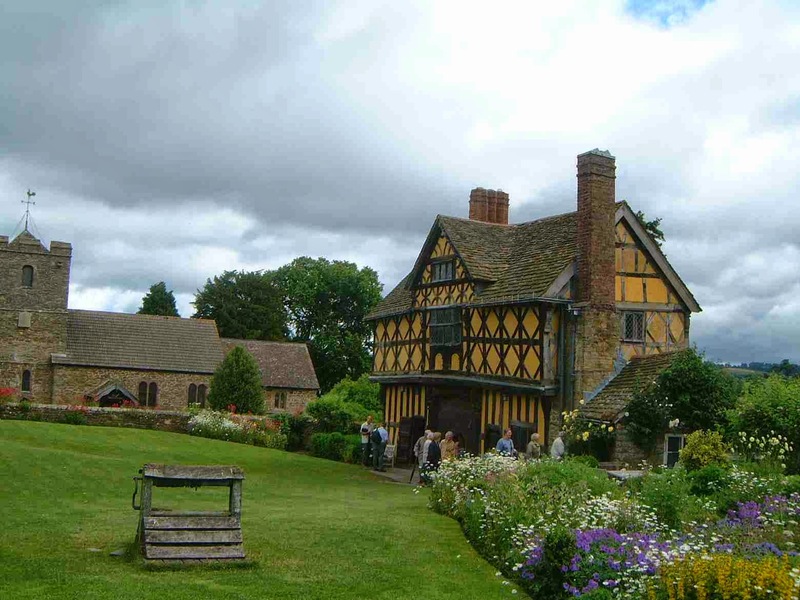 This Leicestershire town, "the rural capital of food", is famous for its eponymous pork pie. The Melton Mowbray pork pie has Protected Geographical Indication status since it was granted by the European Union in 2008. You can read more about PGIs at Matthew Rippon's brilliant blog foodandgeography, including a detailed exploration of the Melton Mowbray PGI. Melton Mowbray has its own pork pie association, the MMPPA, which also hosts and runs the British Pie Awards (see below). There are currently 10 members of the MMPPA, which can call their pies 'Melton Mowbray'. 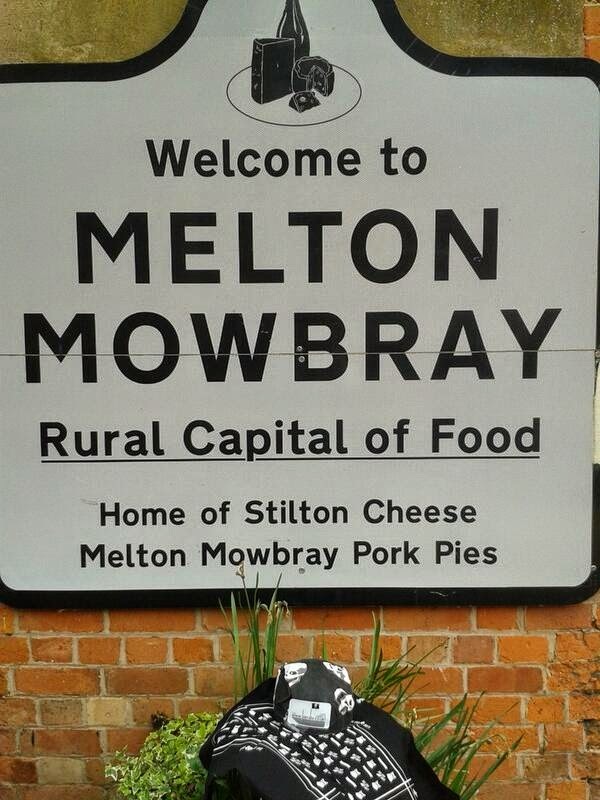 You can read more about Melton Mowbray pork pies below. Two of the main pie contests in Britain are the British Pie Awards and the Scotch Pie Club Awards. 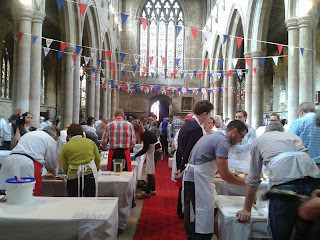 The British Pie Awards 2014 were held on the 30th April 2014, and the winners can all be found here. If you'd like to read more about the BPAs, you can read our guide to the British Pie Awards, which we judged at in 2014. You can also read our guide to the Scotch Pie Club Awards, where we were also judges. For more pie contests, here's a list of pie contests in the UK and around the world. 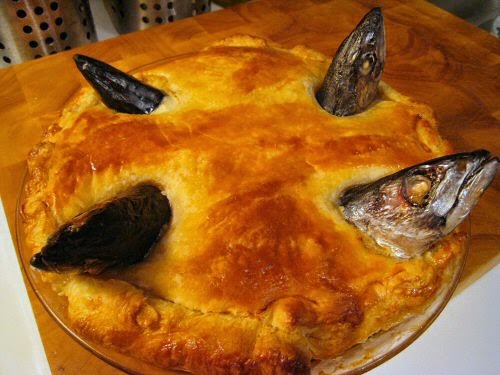 Stargazy pie is a traditional Cornish dish where fish heads poke through the pastry to gaze at the stars. The dish is served at the Tom Bawcock's Eve festival in Mousehole on December 23, where a large stargazy pie is paraded through the village in honour of Tom Bawcock himself, who once braved the storms to catch enough fish to feed the whole village. Fidget pies are a traditional Shropshire dish thought to have been made for at least 400 years. The pie contains a mixture of gammon, onion, potatoes, cider and apple, and was a lunchtime snack of farm workers who could carry them while at work. The name either came from the original five-sided shape of the pie, or from the local name for a pole cat, 'fitchett', owing to the pie's foul smell during baking. A Scotch pie is, unsurprisingly, a Scottish tradition. The meat is often highly spiced minced mutton, though may be other meat. 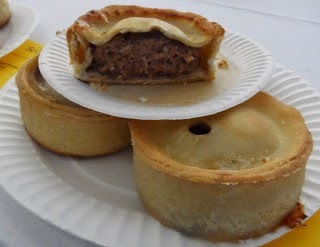 Scotch pies are commonly sold at football matches. 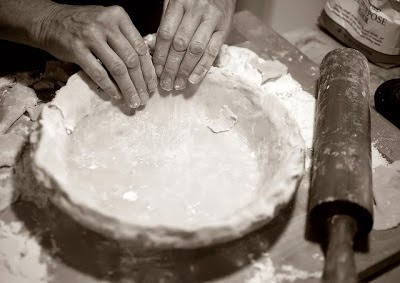 The hot water crust often means the pastry is quite solid, making it easy to eat by hand. The pie is normally quite small, and the sides are often quite straight with a top crust placed lower than the rim. Melton Mowbray Pork Pies are a Protected Geographical Indication (PGI), meaning that any pie calling itself a 'Melton Mowbray' must be made in a specific style and also within a predetermined area around the Leicestershire town of Melton Mowbray. Unlike regular pork pies, MM pork pies are not cooked in a case, giving them characteristic bowed sides and contributing to a deeper golden brown colour of the pastry. 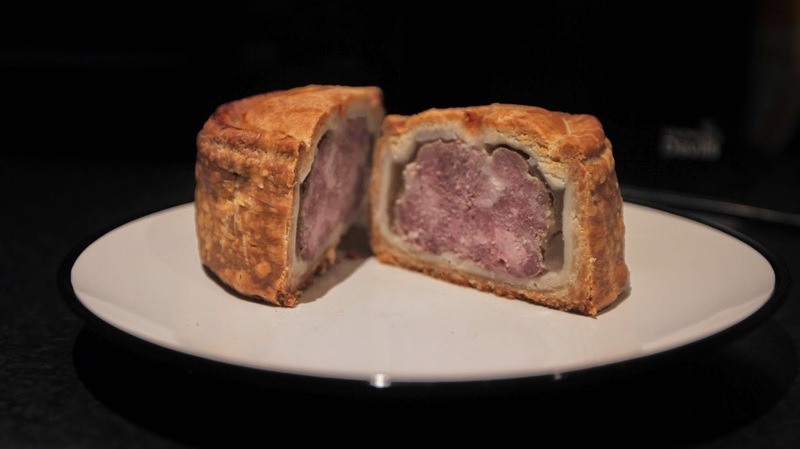 The pork filling is uncured and therefore greyer than other pork pies, which are pink in colour due to their use of cured meat. 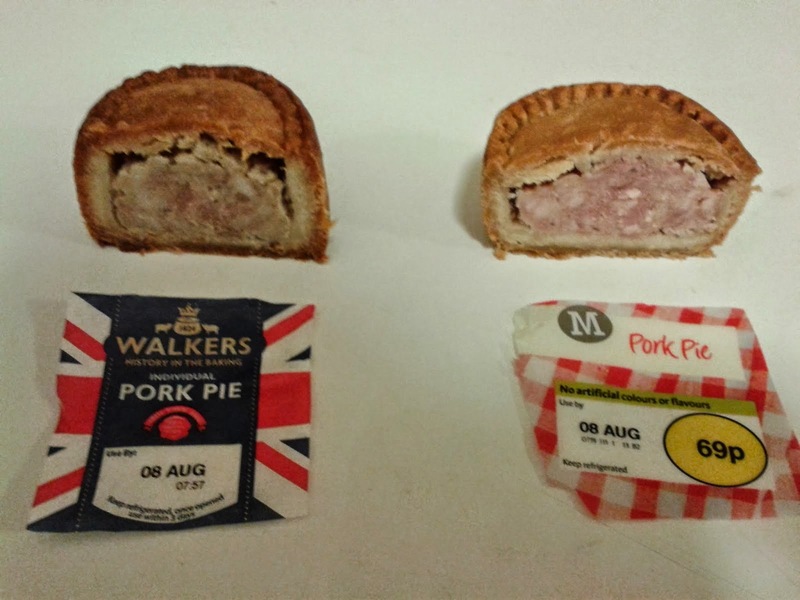 MM pork pies must also be free from artificial colours, flavours and preservatives. 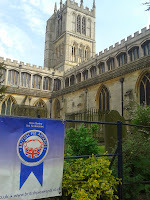 You can read more about PGIs and Melton Mowbray pork pies at the foodandgeography blog. 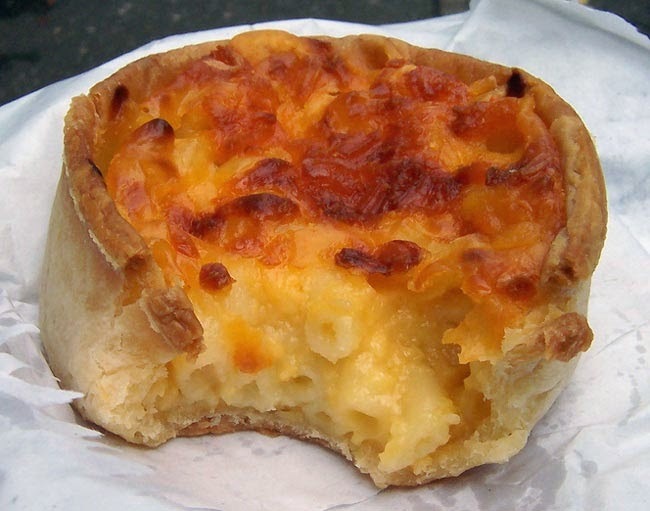 Like the Scotch pie, the macaroni pie is another Scottish classic. It is a traditionally an open pie containing macaroni and cheese, and made with hot water crust pastry. This traditional Lancashire dish contains mainly potatoes and onions. Also known as 'Catholic pie', it is thought to have been created for the Catholic community who could not eat meat on Fridays. 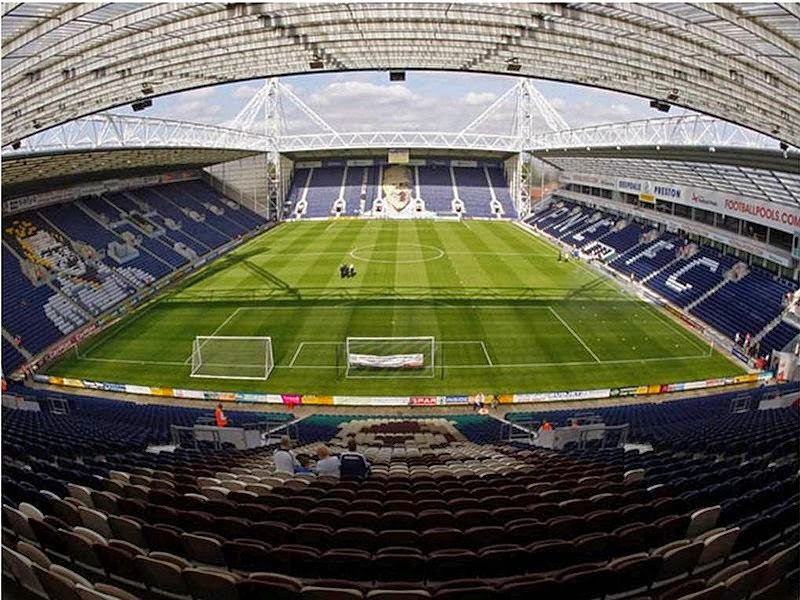 Butter pies are now back on the menu at Preston North End football club after Holland's Pies stopped selling them in 2007. 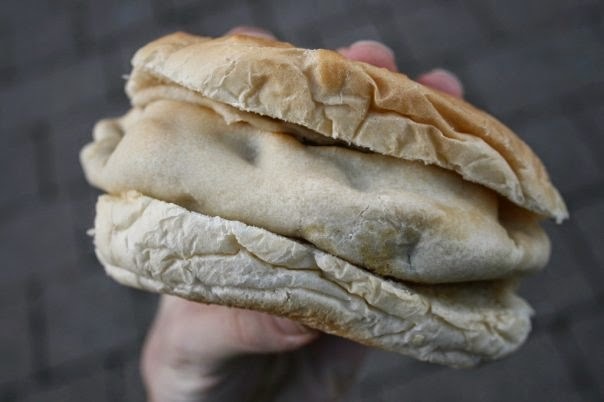 Also sometimes called a Wigan Slappy, this is essentially a pie sandwich - a meat pie slapped between two bits of bread. Oh, the age old question! Is shepherds pie a pie? Does a pie need a pastry lid? Is a ceramic dish topped with pastry a pie, or just a pastry-topped casserole? Is a steak and kidney pudding a pie? These are all relevant questions. Everyone will have their own definition of what is and isn't a pie. That's fair enough. Here at Pierate, we believe a pie is a filling totally and wholly encased in pastry (as per the British Pie Awards requirements) with a definable base, sides and lid. This definition would exclude pasties, sausage rolls, shepherds pies etc from being a pie. It would also exclude top-crust casseroles, pies with no lid and lattice pies from being a pie - but for the purposes of the blog we still allow these as pies. Incidentally, there is now a petition to make it a crime to call a pastry-topped casserole a pie! Filo pastry can also be used for pies, particularly for the lid. Experts at the University of California, Los Angeles, have looked into the science of baking the perfect apple pie, and have made a few suggestions for how baking the perfect crust can really be easy as pie (New York Times). To achieve a lovely golden brown colour with your pie crust, exploit a chemical reaction called the Maillard reaction. This occurs at high temperatures between amino acids such as proteins, and sugar molecules such as lactose, and it gives the pie crust its beautiful brown complexion. So brushing the pastry with something with lots of protein, like egg, that’s mixed in with a lactose-rich solution, such as cream, means you’ll promote these browning reactions. To get the right crust texture so that the pie holds itself together but isn’t too tough, the formation of gluten protein networks is the key player. Flour contains two proteins, glutenin and gliadin, which form gluten when mixed with water. If your flour has a high protein content, when it meets water it will form quite extensive gluten protein networks which make the crust too dense and chewy. Using flour that’s lower in protein will make the crust more tender. You can also add alcohol (such as vodka) or vinegar to the mixture to prevent the formation of theses gluten network and get a tenderer, flakier crust. Butter is really just water droplets dispersed in a fat matrix. When this water is heated, it turns to gas, filling your pie crust with air. This gives the crust a nice flaky texture. Butters can vary in their fat and water content, so using a butter with a lower fat content and higher water content should give a flakier crust. Importantly, however, butter also prevents flour from forming the gluten networks. Therefore you want to make sure that your butter pieces are small enough to be evenly distributed throughout the dough and mop up all the dry flour before the water is added, but don't forget to also add some larger butter pieces to form nice air bubbles and keep the pastry flaky. There's so much more to pie than meets the eye.